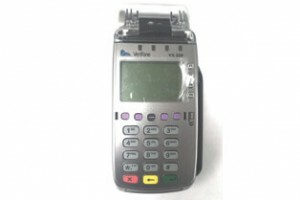 Verifone VX520 terminal with EMV reader, contactless reader, and dual com modem. This PCI compliant countertop credit card machine is highly recommended because it is the best way to future proof your business. Verifone VX520 terminal with EMV reader, contactless reader, and dual com modem. This PCI compliant countertop credit card machine is highly recommended because it is the best way to future proof your business. You can take a card by swiping the magnetic stripe, by inserting the EMV smart card into the EMV reader, or by waving a card or smart phone enabled with NFC over the contactless reader.